Jason and I like to listen to podcasts when we wash dishes and clean up the house every evening after Cadence goes to sleep (an exciting existence, I know). One of my favorite shows is Science Friday and, while catching up on post-Thanksgiving cleaning and a backlog of podcasts, I heard a segment they recorded with Temple Grandin. Among many other things, Temple Grandin is a teacher, a scientist, an engineer, a geek, an activist, and a person with autism. I find her to be an inspiration. 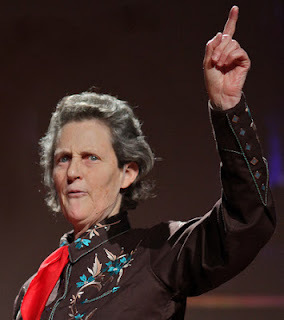 Temple Grandin has a uniquely objective empathetic ability and a keen sense of perception when it comes to understanding the world from another's perspective - be it human or animal. She is probably best known for using her unique gifts to design more humane slaughter houses. One of the traits I most admire about Temple Grandin is her honest assessment of the world around her as well as her inside world. She brings this honest assessment to her own strengths and she has engineered a life that honors those qualities. Rather than wishing she were more like others or dwelling on differences, she values and celebrates the unique way she perceives the world and processes information. What are your unique gifts? Why are you grateful for them? What can you do this week to honor your gifts? You can see the Science Friday video of Temple Grandin here, and if you have not yet seen it, I highly recommend the 2010 HBO movie, Temple Grandin. I am so excited that you mentioned this woman - I read about her a long time ago in an article about Autism. It is wonderful that she embraces how she is or she would never have contributed to the world the way she has. I LOVE your thoughts on hugs - that's just beautiful!